The UAE is blessed with a vibrant and diverse demographic made up of over 200 nationalities. Emiratis, or national citizens of the UAE, make up almost a fifth of the population. Almost all B2C brands say they want to reach and engage with Emiratis on social media, but the majority find it difficult to do so and make a lot of mistakes in the process and end up delivering the wrong message. Use the right platforms. Instagram is the most popular platform for Emiratis, followed by Twitter, Snapchat, and lastly Facebook. Optimise your content, your website, and your ads for mobile. Emiratis are heavy users of smart phones. Post frequently, with more images and less text. Emiratis love social media and spend generous amounts of time on it. Connect with local Instagram celebrities and influencers to seek exposure through genuine reposts. Extend your support as much as you can and look into accommodating different types of communications and requests. Expect your online shop customer to ask for a Whatsapp number or Kik account to order items and pay cash on delivery, or the patient at your hospital to send you questions regarding their next doctor appointment through an Instagram direct message. If you support them there, it can pay great dividends. Emiratis are generous and they appreciate a generous effort to help. Advertise smartly and be concise. Emiratis just like anyone else can cut through the sales talk. Deliver your message through valuable content. Need to sell a holiday package? Advertise using a free quick travel guide. Be conservative and respectful with your visuals. Nobody cares if an international celebrity is using your brand if she's going to sport it half-naked. Don't Use stock photos of what you think are Emiratis. How do you think Emiratis would perceive your brand if you use an image of a Caucasian male wearing a Kandoora, or an Arab man wearing a Saudi thobe? Not good. If you have to use stock photos go for an authentic source such as ArabianEye (now part of Getty Images). 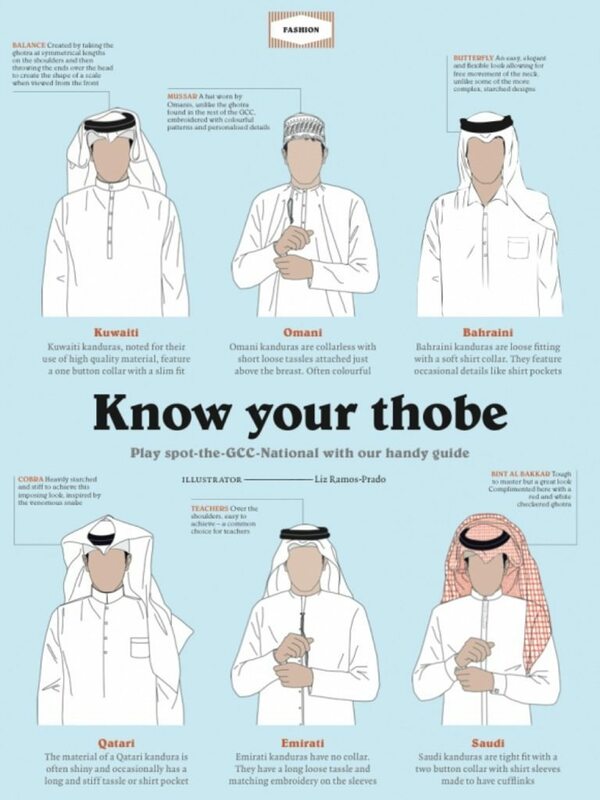 This guide from Brownbook illustrated by Liz Ramos-Prado will help you tell the difference between male dress types in the GCC. Don't overbrand. You can throw in your logo every now and then, but slap it on every image and you're guaranteed to lose followers. Don't Google translate your content into Arabic or outsource it to remote translators and copywriters who know nothing about the UAE. If you wish to use colloquial UAE Arabic in your communications, enlist the help of local talents or copywriters who have experience with Emirati dialect. Use local freelance marketplaces such as Nabbesh. Don't assume that Emiratis only read Arabic, especially if you're targeting younger audiences. One of the most popular and successful accounts on Instagram in the UAE is for a local burger brand @findsalt by two Emirati women entrepreneurs, and they post entirely in English. Don't stereotype. Emiratis are a very diverse community with a wide variety of background and interests. There's employees and there's entrepreneurs, athletes and couch potatoes, Corollas and AMG G-63s, college drop outs and PhDs, hipsters and ... well, non-hipsters. Did we miss anything? Share with us your experience.